Make your pipes work, call Pipeworks! So, you’ve got a drain clog. It’s an inconvenience, but not the end of the world. In fact, it’s an incredibly common household problem. You can just run over to the store, buy a store-bought drain cleaner, and fix the solution quickly, right? Wrong! Store-bought drain cleaners promise to work miracles for your plumbing system, but don’t be fooled. These drain cleaners can never compare to the work of a professional plumber. These drain cleaners are actually detrimental to your plumbing system. If you have a plumbing problem (even something as seemingly minor as a clog) you need a professional for the job. If you need drain cleaning in Bloomington, IL contact our team. We’ll tell you. Like we mentioned above, store-bought drain cleaner are detrimental to your plumbing system. These cleaners are able to remove clogs because they use extremely corrosive chemicals to do the job. These chemicals pour into your system and eat away at grime, hair, and soap scum clogging your pipe. The problem is that they aren’t always effective if the clog is persistent and that they don’t have an “off” feature. When you have a clog, you can’t tell how big it is just from looking down your drain. So when you pour a store-bought drain cleaner down your pipe, you could be pouring this onto a huge clog. If the drain cleaner can’t eat through the clog, it will remain on top of the clog and start to eat away at your pipe, weakening the system overall. Don’t pour these caustic chemicals down your pipe, let a professional clear your system responsibly. Here at Pipeworks Inc. we know how to clear a drain clog without hindering your plumbing system. Our services are thorough. You won’t have to worry about how our cleaning services affect your drain or if the problem will arise again because it wasn’t fully cleared the first time. We have the right tools to clean your drain for you and the expertise to go with these resources. Even if you have your own drain snake or auger, you need the experience of a professional to actually use this tool to be helpful rather than harmful to your very delicate plumbing system. Any time you have a plumbing problem! 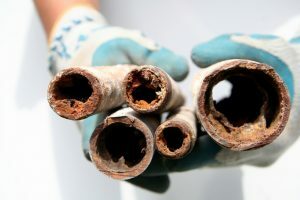 We see the aftermath of lots of plumbing disasters that could have been prevented if the homeowner sought out service for their plumbing system much sooner. Even if you think the plumbing problem, you’re experiencing is minor and doesn’t need the care of a professional, it’s better to be safe than sorry. When it comes to plumbing problems, you want time and knowledge on your side. Luckily, we provide both of those things here at Pipeworks Inc. We’ve served the Bloomington, Champaign, and surrounding areas since 2002. You can trust our team to provide you with the best service available. Need a drain cleaning? Call on our team here at Pipeworks Inc.
© 2016–2019 Pipeworks Inc.. All rights reserved.